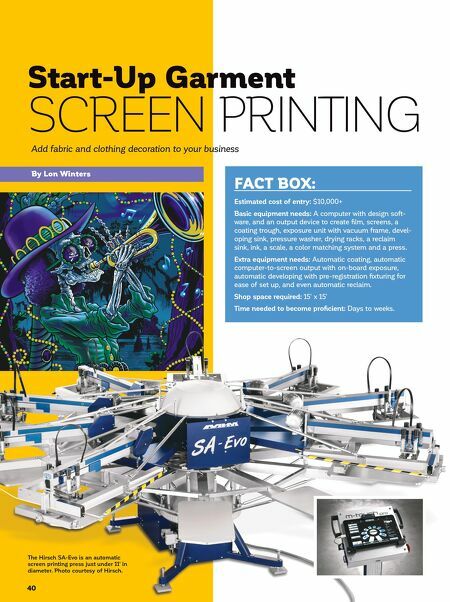 S T A R T H E R E 2 0 1 8 Start-Up Garment SCREEN PRINTING Add fabric and clothing decoration to your business 40 FACT BOX: Estimated cost of entry: $10,000+ Basic equipment needs: A computer with design soft- ware, and an output device to create film, screens, a coating trough, exposure unit with vacuum frame, devel- oping sink, pressure washer, drying racks, a reclaim sink, ink, a scale, a color matching system and a press. Extra equipment needs: Automatic coating, automatic computer-to-screen output with on-board exposure, automatic developing with pre-registration fixturing for ease of set up, and even automatic reclaim. Shop space required: 15' x 15' Time needed to become proficient: Days to weeks. 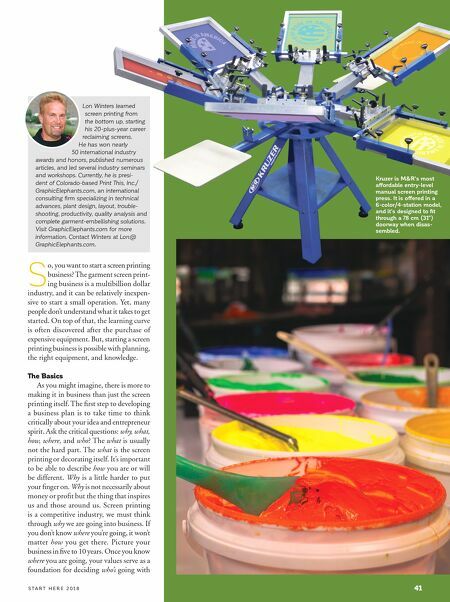 By Lon Winters The Hirsch SA-Evo is an automatic screen printing press just under 11' in diameter. Photo courtesy of Hirsch.